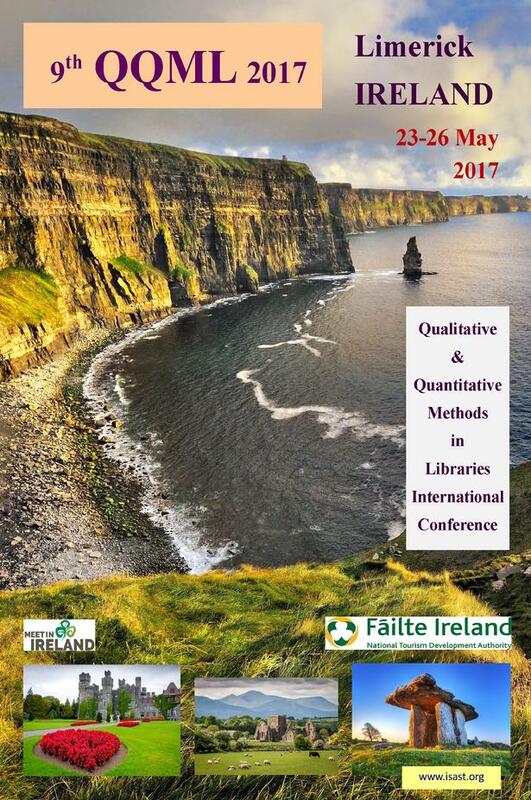 The 9th Qualitative and Quantitative Methods in Libraries International Conference (QQML2017) was scheduled during the previous 8th QQML2016 Conference. QQML2009, QQML2010, QQML2011, QQML2012, QQML2013, QQML2014, QQML2015 and QQML2016 were successful events both from the number and quality of the presentations and from the post conference publications in Journals and Books. QQML2017 will continue and expand the related topics. Qualitative and Quantitative Methods (QQM) are proved more and more popular tools for Librarians, because of their usefulness to the everyday professional life. QQM aim to the assessment and improvement of the services, to the measurement of the functional effectiveness and efficiency. QQM are the mean to make decisions on fund allocation and financial alternatives. Librarians use also QQM in order to determine why and when their users appreciate their services. This is the start point of the innovation involvement and the ongoing procedure of the excellent performance. Systematic development of quality management in libraries requires a detailed framework, including the quality management standards, the measurement indicators, the self-appraisal schedules and the operational rules. These standards are practice-oriented tools and a benchmarking result. Their basic function is to express responsibly the customer (library user) -supplier (library services) relationship and provide a systematic approach to the continuous change onto excellence. The indoor and outdoor relationships of libraries are dependent of their communication and marketing capabilities, challenges, opportunities and implementation programmes. The weather from 23rd May to 26th May is expected to be mostly sunny and on Thursday, the 25th, with increased cloudiness and a light breeze. However, no rain is expected. Temperatures will range between 9°C at night and 17°C to 18°C during the day.